New York state is home to 17 species of snakes. These animals, whose tubular, limbless bodies are instantly and universally recognized, produce mixed reactions among people, from fear to fascination. Serpents figure prominently in the mythologies of nearly all human cultures, sometimes as a symbol of evil and temptation. It is perhaps for this reason that snakes often are persecuted and killed without any understanding of their true nature. Snakes play critical roles in the environments where they occur, primarily by the position they hold in food webs in natural communities. Many snakes are top level predators; for example, a single rat snake can consume over 100 rodents a year. Other snakes are important in the control they exert on insect and other invertebrate populations. All snakes form part of the diet of other predators such as hawks and foxes and thereby serve to link higher and lower feeding levels. The most widespread and frequently encountered snakes in New York state are the garter snake and the water snake. Garter snakes use a wide variety of habitats, from woodlands to marshes to fields and exist quite well around human habitations. These snakes, like many other species, are variable in color and pattern; the basic color is dark brown or green with three yellowish stripes down their sides and back. They may reach lengths of two feet, but are typically smaller. They are completely harmless to people. The water snake is found in and around almost any waterbody or wetland in the state. As an adult, it is a stout animal typically dark brown to black with lighter-colored bands and splotches along its length. This is most pronounced in young individuals (adults may appear solid black). It is the only large (up to 42 inches) water snake in our range. This species is frequently called or mistaken for a cottonmouth (water moccasin); this latter species is a large venomous snake that does not occur within our state borders. This confusion is understandable as our water snake is certainly an aggressive species with a nasty disposition and it does bear a superficial resemblance to the cottonmouth. The milk snake has given rise to more misconceptions than perhaps any other species. Its name is derived from the decidedly false belief that it will milk cows! It is, however, frequently encountered in barns in search of its rodent prey (it also eats other snakes). The milk snake is a boldly patterned serpent (brown or reddish blotches on a light grey to tan body) that vibrates its tail when annoyed. These characteristics are undoubtedly responsible for its being called "spotted adder" in some regions, an unfortunate name because it brings to mind the truly venomous snakes of Europe and Asia. The milk snake is harmless. The largest species in New York is the black rat snake, reaching lengths of eight feet! These largely black-colored snakes are found primarily along cliffs and rocky slopes but are absent from most of the Adirondacks. It is an impressive animal that overpowers its bird and small mammal prey by constriction. Other kinds that occur all across New York in appropriate habitat are the green, redbelly, brown, and ringneck snakes; all four of these are small, slender, and completely benign species that feed on insects, spiders, earthworms and slugs. Each is described quite well by their common names. There are only three species of venomous snakes living in the wilds of New York (many other kinds may be found in the homes of private individuals and, occasionally, escapes occur!). These are the timber rattlesnake, the massasauga (erroneously called "pygmy rattler"), and the copperhead. All three are uncommon. The timber rattlesnake (listed as "Threatened" by the New York State Department of Environmental Conservation) enjoys the widest range; it is found mainly in the southeastern part of the state, except Long Island and New York City, with scattered populations as far north as Lake George and also along the Southern Tier in western New York. Its populations have been severely reduced, primarily due to bounties and commercial capture for snakeskin products and the pet trade. The massasauga (listed as "Endangered") occurs in only two locations, both large wetlands. One is located northeast of Syracuse and the other is west of Rochester. This species is the subject of a cooperative research program between researchers at SUNY-ESF and NYSDEC. The copperhead is mainly found along the lower Hudson Valley south of Kingston and scattered through the Catskills. If you encounter a snake but can keep your distance, the snake will nearly always refrain from striking. If you should be bitten, obviously the most important first thing is determining if the snake is of a venomous variety. It is always a good idea to become familiar with the venomous snakes in your area, including the outdoor places you plan to visit. Bites from nonvenomous snakes are generally inconsequential; however, it is prudent to review when you last had a tetanus immunization. Bites from venomous species are a more serious matter and you should always seek immediate medical assistance. 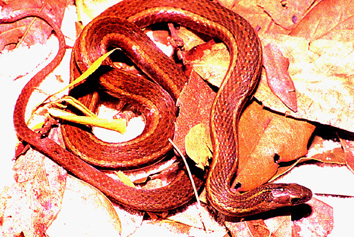 Commercial snakebite kits, which suggest making lacerations in the area of the bite and applying suction and tourniquets are not recommended. Venomous snakebite is rarely fatal among healthy adults. The timber rattler and massasauga both possess a rattle at the end of their tails. It is made of a series of hollow scales that produce a distinct buzz when the snake vibrates its tail (a new one is added each time the snake sheds its skin, which may be several times a year). Both rattlers are sort of chunky snakes but the timber rattlesnake can attain lengths of up to six feet while the massasauga barely reaches three feet. A timber rattler's head is much wider than a massasauga's and there are numerous small scales on the crown of its head; the massasauga has nine larger scales on the crown. Copperheads lack the rattle, but will vibrate their tail when annoyed. In dry leaves, this vibration can sound like a rattle; many other species, such as milk and rat snakes, will also perform this behavior. The copperhead can be told by its coppery-red head and by the distinct bands along its body which are widest at the sides and narrowest across the back. Venomous snakes are best left alone. None of our species are particularly aggressive animals, but they will attempt to bite when handled. Snake Species Within New York Click on thumbnail image for full-size version All photos by John White (copyrighted). Used with permission from University of California CalPhotos collection. For more information, visit the Cortland Herpetology Connection. Prepared by Glenn Johnson, Department of Environmental and Forest Biology, SUNY-ESF. Updated with the assistance of James P. Gibbs, Professor, Department of Environmental and Forest Biology, SUNY-ESF. Photos courtesy of the Museum of Natural History for the Province of Nova Scotia and the University of California.